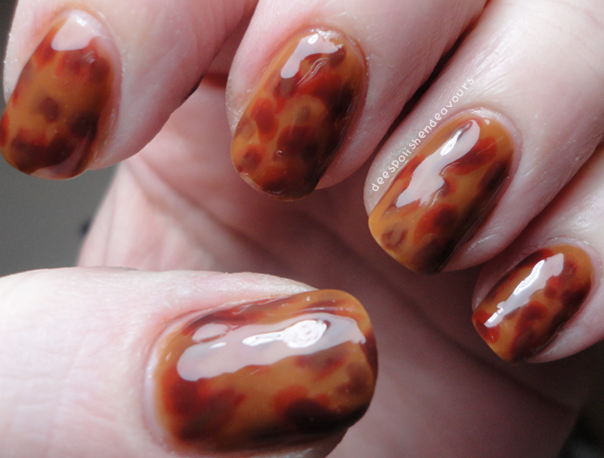 Today, I have a post by Dee over at Dees Polish Endeavors! She's been blogging since 2009! She's one of the first blogs I remember following when I got into nail polish. Thank you for the post Dee! I'm extremely excited to be a guest blogger here at Imperfectly Painted - if my memory serves me correctly (and it fails me on many occasions) this is my first official go at writing a guest blog.. I hope I don't fail miserably! Cross your fingers for me. When I said I'd be interested in doing a guest post for Stephanie, I knew I had a special trio of polish on its way over to me - and I also knew that if they made it to me in time, I'd be doing the tortoiseshell nails ala ChalkboardNails. Judging by the title of this post, the polish trio showed up.. and I went with my original idea. I know, not as good as the original - but, I have to tell you all.. I love these nails! I think my next go round with them, I will have more activity and layering going on. I mean, there is a wealth already, but I feel like more would be a genius way to go about this. I was able to get my mitts on the polish trio she used, which is created by Elevation Polish. The polish are: Temperance, Cascade, and Tettegouche. They are all jelly formulas, and they are all fantastic! I can imagine that if any of you happened to nab these gems when they came up for sale - your plan, like mine, is to use them to recreate that particular manicure. My one word of advice: DO IT! It isn't very complicated, and it looks amazing! 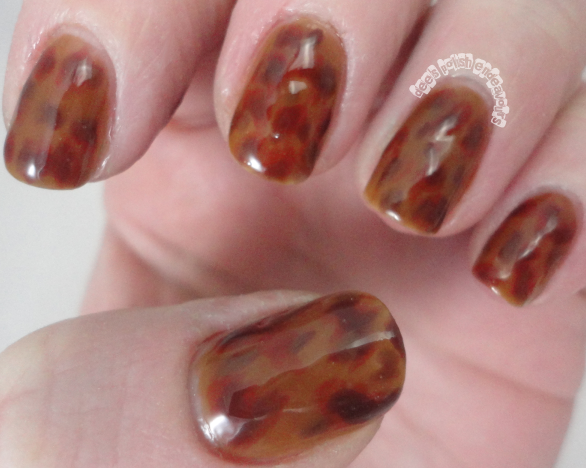 Even if you don't have these particular colours, you could do something similar with jelly polish - ooh, like a colourful tortoiseshell print! Could you imagine? I can. I like! Thanks for having me Stephanie, it was an absolute pleasure - and to all of you - thank you for stopping by! Take care until next time.. These are really fantastic! This looks like it took so much time and patience! Gorgeous! This actually looks like the shell of a turtle I had years ago! This is beautiful! It looks like it would take a lot of time to do...I am not the most patient person, so I don't think this is something that I would attempt, but thank you so much for sharing this with us. Yay! Thanks again for allowing me to a guest post Stephanie! And ladies, I can assure you all - it did not take a very long time.. maybe 30 mins from base coat to top coat!